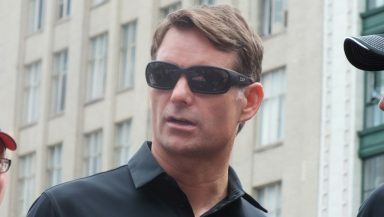 On Wednesday, Jeff Gordon was in Toronto as part of NASCAR’s promotional driver tour to promote the Chase for the Sprint Cup with sending each of the 16 drivers to a different city, titled the “Chase across North America”. While all of the Sprint Cup Series races are in the United States, many fans travel from Canada to see the races live, whether traveling to Michigan or Bristol or all the way down to Daytona. Though Gordon’s Canadian connection goes beyond just being a favorite driver of many fans as Gordon is trying to build a track in Fort Erie, Ontario, titled Canadian Motor Speedway. The project has been ongoing for a couple of years now and ground hasn’t been turned to start building the track as a result of series of government meetings to get building permits and other stoppages on the project removed. Gordon became involved in the project after architect Paxton Waters got hold of him through his stepfather John Bickford. While news has been low key and quiet as of late surrounding the project, Gordon notes that the current status of the project is ongoing, but it’ll be a long, slow process to getting the track built. “I’m excited for it,” he commented. “Every few months, I go, ‘Okay, where are we at?’ and I keep getting good news each time that I ask. Just like I said earlier, we brought the simulator into my office recently so we’re moving forward. I can’t say that we’re full speed ahead because it takes a long time for these projects to get done. As the key track designer for the proposed 3/4 mile oval, Gordon is hoping to feed off his experiences as a driver to build the perfect track for side-by-side racing. A critical part in ensuring good side-by-side racing is the transition between the straightway and the corner. “I’ve always loved the transitions that Michigan has from straightaway to corner. On a bigger track, you have more space to make those transitions,” Gordon explained. “We would like to do more of a ¾ mile race track so just coming from Richmond, it’s fresh in my mind about those things. I just had a meeting about that last week. In going to Canada, I started thinking about the track that we’re designing and we’re so hopeful and pushing hard to get done. I think about how we’re trying to make those transitions to make a type of race track like Richmond, Iowa even better. Gordon says they’re getting closer in finalizing the final track plans as they’re putting a simulator in his office right now. “We’re going to map out the track and put it into simulation where I’m going to be able to drive it,” he noted.